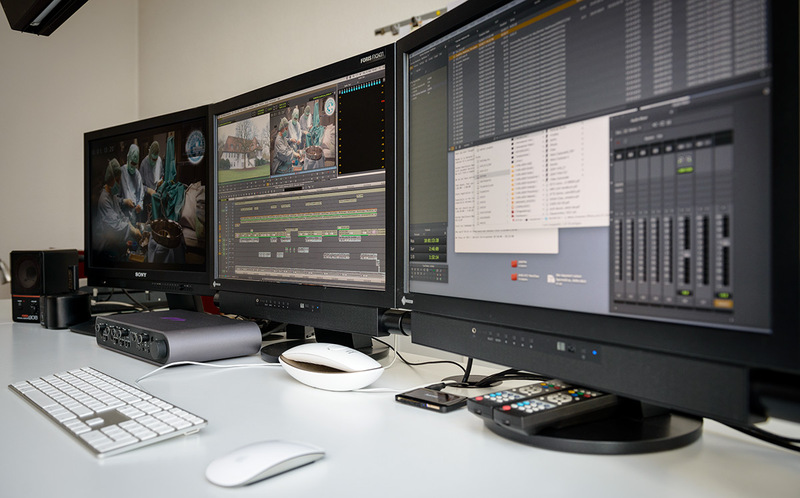 Basiliscus Production supplies an edit suite available for hire with our in-house Editor at our Berlin city Centre production office which is based not far from Potsdamer Platz and the Kurfuerstendamm. The suite features several Mac Pros and a super fast 48 TB Raid which offers enough space even for very large projects. For a fast data exchange we draw on our own server. Also available is a MacBook Pro should you need to cut directly at the film set. So we have the possibility to produce a first rough cut on site and judge the quality of the film material. We provide the complete workflow from search and logging, the pre-selection of your film content, a first pre-cut up to the final cut. This includes professional implementation of effects, a sophisticated graphic design, sound and sound processing, color grading and the output of the finished master at the end.